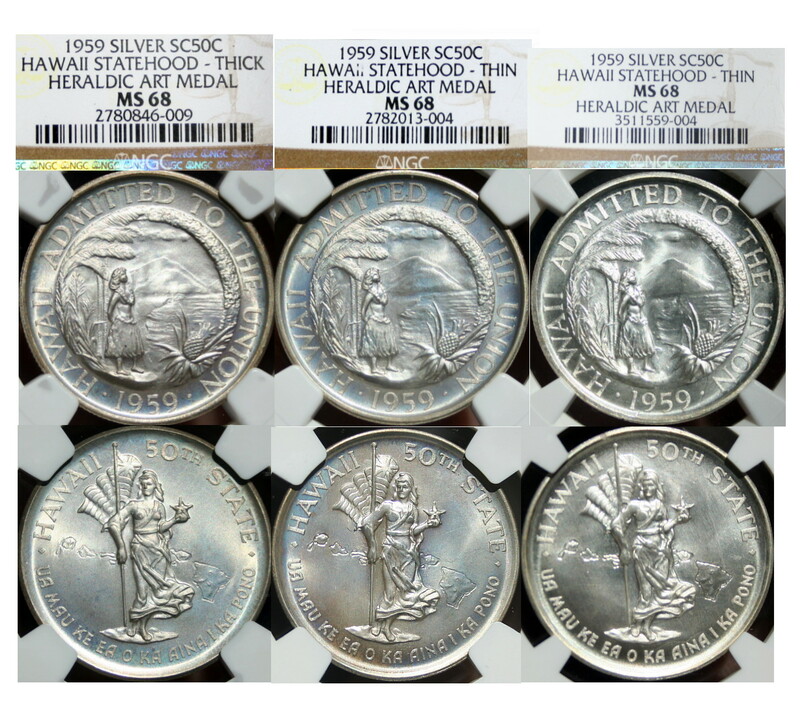 2MS-4 is a thin variety of the 1959 Hawaii Statehood Heraldic Art medal. Its the size and thickness of a US half dollar and struck in sterling silver. 2MS-5 is the same medal, but with an increased thickness as to change it dimension to comply with the desire of the US government. This medal is collected by both the Hawaiiana specialist and So Called 50 Cents (SC50C) specialist. On the morning of February 23, 2013, I was examining seven specimens (both 2MS-4 and 2MS-5) and made a discovery. I was improving my numismatic grading skill set by comparing different grades of the same medal. I posted this find on my twitter account that day. Both medals are NGC MS 68 graded/encapsulated (3511559-004 and 2782013-004 are the specific NGC certification identifiers). That evening, I posted the two coins on eBay to fish for collectors inputs (price was set ridiculously high). Where better place to find the experts than one who is actively buying/selling? I received confirmation by the so called SC50C experts that this was a new discovery. Imagine that. After 54 years, no one bothered to compare the exact same medals in their collection. 1. Focus on the hula dancer’s head. 2. Locate where the volcano touches her head. 3. If the volcano touches her forehead, this is an original die. 4. If the volcano touches her chin, this is a re-worked die. Left is original die. Right is re-worked die. 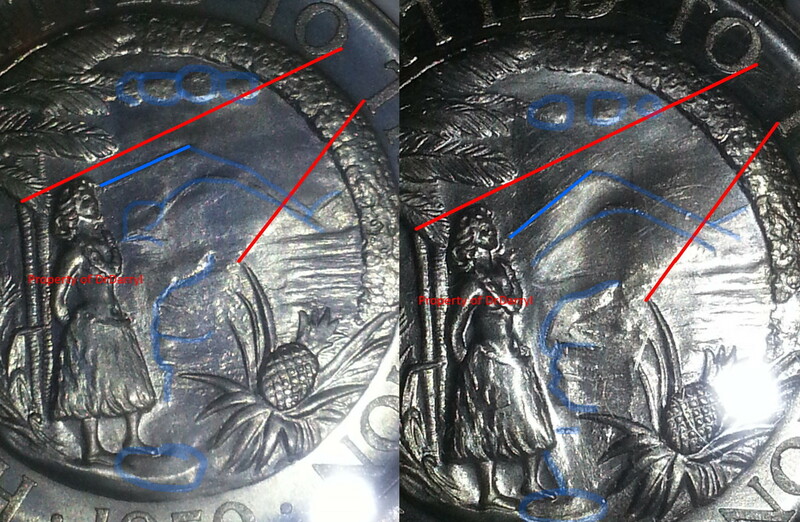 Left medal has strong details (clouds, waves and volcanos). Volcano aligns with hula dancer’s forehead. Volcano’s slope is normal. Rightmost volcano has a steep incline. Right medal has lost details in the clouds, waves and volcanos.